What is CouponFleaMarket.com about? What do you do? CouponFleaMarket.com is a marketplace where you can secure Coupon Clipping Services from multiple vendors all in one site. The Clippers on CouponFleaMarket.com are from all over the country and offer a wide range of regional coupon variations. The Clippers charge for their services individually and each has their own unique pricing structure. Do I have to register to use CouponFleaMarket.com? Yes, in order to use the CouponFleaMarket.com website you must register an account with complete information. Your name and address will be shared with any Clipper that you place an order with. 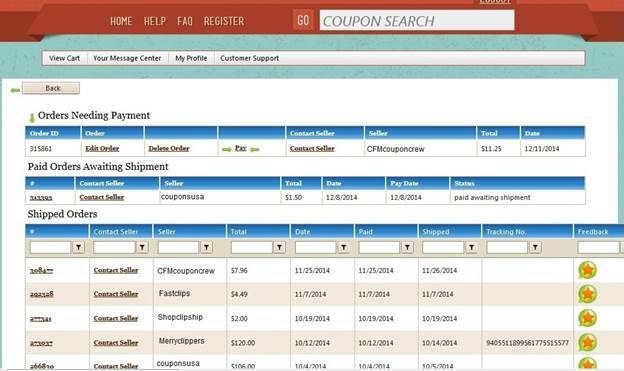 Your phone number and email address will only be viewed by CouponFleaMarket.com administrators and Customer Service Staff. When registering does my PayPal address have to match my Coupon Flea Market address? Yes, please make sure that your address matches on both, to ensure there are no delivery delays or deliveries going to the wrong address. If you need your item sent to a different address, you can contact the seller on CouponFleaMarket.com. Messages MUST be sent thru the Coupon Flea Market message system. Notes left on PayPal will not be seen nor responded to by the seller. I have a registered account but cannot login, how do I get help? Most login problems stem from one of two errors. Having the caps lock turned on your keyboard will cause an issue, so please make sure it is not on. Also trying to use both your username and email address to log in with will cause an issue. Using only one or the other should resolve the problem. If that doesn’t resolve the issue, try closing the browser page and opening a new one and try to log in again using either your username OR your email address. If you still experience issues please contact CouponFleaMarket.com so we can assist you. For assistance simply click on “Help” from our home page, or from the navigation bar you can click on “Customer Support” then select “Contact Customer Service” For site technical issues you can click on “Customer Support” then select “Contact Technical Support”. There are so many listings. Is there a way to sort my search results? Yes, of course. When you conduct a search you can easily sort the results by clicking on any of the blue header columns. When do new coupons get listed on the site? All clippers list on a different schedule. Most list newly released coupons between Friday and Monday. Not seeing the new coupon you want? Please check back again…they most likely just didn’t list it yet! Some coupons have abbreviations listed in them like DND and ETTS what do those mean? Clippers sometimes use abbreviations for common wording found on some coupons. OK I found the coupons I want, can you explain how to purchase them? Once you click on the coupon you wish to purchase the screen below will appear. (See Figure 1) This screen offers all the information pertinent to that particular coupon from your chosen seller. Information available on this screen includes the expiration date, the insert the coupon came from, all restrictions stated on that seller’s coupon as well the seller’s shipping cut off times, and where the seller will be shipping from. Other information is also available here by clicking on any of the tan boxes to the left of the screen. When you are ready to order just fill in how many lots you wish to buy, then simply click “Calculate Total”. A total will appear below that explains how many actual coupons you will receive as well as a subtotal of that purchase. If this is how many you wish to receive click on the “Add to Cart” button. Once clicked, your coupons will have been added to your cart. You will then be taken to the “View Cart” screen where you can edit your order, contact your seller, see orders shipped and more. Is there a minimum or a maximum on how many coupons I have to or can buy? Minimum is one lot of coupons. There is no maximum, purchase as many as you like! I am going to be buying more than 20 coupons, can I have a better price? Each clipper has their own unique pricing structure and many offer discounts when coupons are bought in bulk. Each listing shows not only the price per set but will also show what their discounted price will be per set when bought in higher quantities. How long do I have till I have to pay for my order? Coupons are time-sensitive items. Unless you have made special arrangements with the Clipper orders must be paid for within 24 hours of purchasing or the purchases are subject to cancellation. I decided I didn’t want one of the sets of coupons I put into my cart…how can I take it off my order? Can I pay for my order by e-check? Please do not pay by e-check. Any order paid for by e-check is subject to cancellation. E-checks can take up to 7 business days to process and clear and CouponFleaMarket.com is not notified by PayPal that payment has been made until the check clears. By that time your order would have been cancelled by the Clipper. I placed an order with a Clipper this morning and paid already and now I want to purchase more from the same Clipper. Do I have to check out all over again or can I add it to my previous order? Yes, if you have already paid for the first transaction nothing can be added to it and you must place a new order. I bought multiple orders from the same Clipper. Will they come in multiple packages or can I have them shipped together in one? Sometimes a Clipper will notice multiple orders from same customer and combine the packaging and sometimes they will not. If they have already shipped out your first order, or processed and sealed the package your coupons might not all come in one package. As accuracy and shipping times are of the utmost concern for our clippers, going back to reconcile multiple orders, or reopen packages impedes the Clippers ability to get orders out as quickly and accurately as possible. Please keep in mind that 100-200 orders might have come in between your orders and some clipping services have multiple people processing orders. I bought multiple orders from the multiple Clippers, can I pay for all my orders at the same time? No, each order will need to be paid for separately. OK I placed my order how do I check whether it has been shipped? Click on the “View Cart” from the home page. A new screen will appear. (See Figure 2 Above) From this screen you can see orders that still need payment, orders that have shipped and when they shipped. You can also edit your orders or even contact your seller! Where will my coupons ship from? Clipping Services offered on CouponFleaMarket.com are from multiple vendors and therefore from multiple city and states. Every coupon will have where your vendor is shipping from located to the extreme right of each coupon in the search results. You can also see where each vendor is from when searching through their individual stores. This information will also be available within each coupon listing. What days do you ship and what are your same day shipping cut off time? Each Clipping Service has their own personal shipping schedule and cut-off times. You should always check the shipping policy of the clipping service you are interested in by looking in the description box inside each coupon listing or by clicking on the tab “Seller’s Shipping Cut-off Times“ inside your clippers store. All Clippers regardless of their shipping policies are required to ship your orders by the end of the next business day, although most will ship your orders out the same day if paid for by the cut-off time they have posted. Sundays and Holidays the Post Office is Closed and therefore no mail can be shipped out. Please note- Clipping Services on CouponFleaMarket.com are run by real people with families and lives and they are NOT required to be available 24hrs a day 7 days a week. All clipping services on The Coupon Flea Market offer free standard 1st class USPS shipping on all orders regardless of size. For your convenience we offer the following shipping upgrades… Priority 2 Day shipping is available for an additional $7.35 for a flat rate envelope and Priority Express 1-3 Day shipping is available for an additional $25.50 for a flat rate envelope. (These are current USPS prices.) If you simply wish to keep track of where your order is, we also offer tracking for an additional $2.99. All of these options are available during checkout. 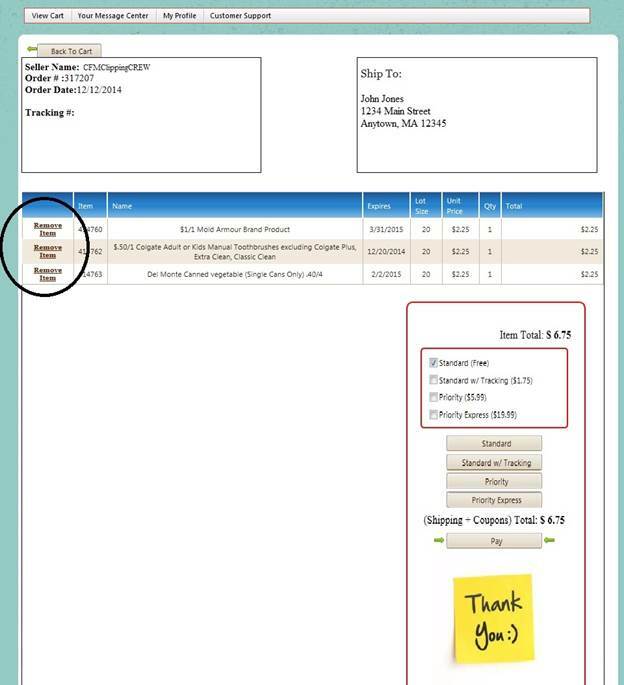 (See Figure 3 above) Once shipped, tracking number for your orders can be located by clicking on the “View Cart Tab” located in the upper left hand side on the navigation bar. The tracking number will be located in the bottom Shipped Orders section. That depends entirely upon the USPS. The Clipping Service is responsible for handing your package to the post office according to their stated shipping policy. The Clippers have no control over how long it takes the Post Office to deliver it. USPS First Class Mail up to 7 business days. USPS Priority Mail 2 - 3 business days. USPS Priority Express Mail 1 - 3 business days. If you feel your order took too long please look at the postmark before contacting the seller or customer service. The only thing that the Clipper is responsible for is having the package delivered to post office for appropriate postmark according to their shipping policy. How long should I wait for my item before contacting you of no show? My order went great! How can I find that specific clipper again? All clippers on the site can be found in the Seller Directory found on the home page. Clicking on the seller name will take you directly to all the coupons they offer. How can we contact the Clippers? · For questions about a specific coupon click on “Ask Seller a Question” from the coupon description page. This will allow you to send a message and automatically tell the Clipper which item you are asking about. 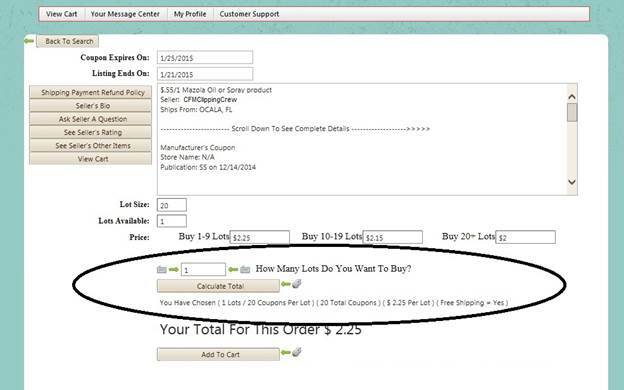 · For questions about a specific order click on “Contact Seller“ from any of your orders in your cart tab. This will allow you to send a message and automatically tell the Clipper which order you are referring to. Any messages about your orders or replies from the Clippers to your inquiries can be found in the tab ”Your Message Center” located to the right of the “View Cart” Tab. I messaged the clipper and do not receive an answer yet. What can I do? Please give the Clipper 24hrs to answer your message and make sure that your message was sent via the CouponFleaMarket.com website. Clippers are not permitted to communicate outside of the CouponFleaMarket.com website so if you leave them a note or send them a message to their PayPal email address they will not be able to respond. If you sent them a message via the website they have 24hrs to answer your message unless it is a specified day off as stated in their shipping cutoff information. Please understand that the Clippers are people too. We understand that your needs are time sensitive but we ask that you understand that Clippers cannot possibly be available 24hrs a day 7 days a week. They do have families and responsibilities outside of their Clipping Services and all people….even coupon clippers…require and deserve days off! If you are having trouble communicating with a clipper or have had no response after the appropriate amount of time has passed, then you can contact CouponFleaMarket.com. Coupons are time sensitive. Expiration dates are also time sensitive and so too are sales. For this reason, we do not offer Returns or Exchanges on accurate orders. However if there is an issue with the Clipper you may contact them thru the message system on Coupon Flea Market to try to resolve the issue. If you feel your issue has not be resolved, you can have Customer Service look into the issue by clicking on the “Customer Support” and selecting the “Open Dispute” button located on the navigation bar. Customer Service is available for issue resolution only AFTER an attempt has been made to resolve the issue directly with your Clipper. Yes, feedback is welcomed and can be a very effective tool if used correctly. Feedback can be left by going into the “View Cart” tab and then clicking on the Green Circle with the Red Star located to the right of each of your shipped orders. You may choose an overall transaction rating of 1-10 by clicking on the appropriate star. You may also leave comments for the transaction. Any feedbacks left that are for a rating of less than 7 will be sent to customer service automatically for review. Please consider your rating carefully. If an order was postmarked according to shipping policy but the post office took too long to deliver it, this should not be considered as part of the rating. Customer Service will consider both sides of the transaction. Please do not use feedback as a “punishment” but rather as an effective learning tool. You may also leave a compliment for a job well done for your clipper. In any business positive feedback is always greatly appreciated! To do this, go to the “Customer Support” tab and select the compliment somebody button. We hope this guide helps makes your shopping experience fast and easy. For specific information regarding the coupons offered on our site please contact the seller directly. Thank you for stopping by!